Life has me behind, more on that another time. 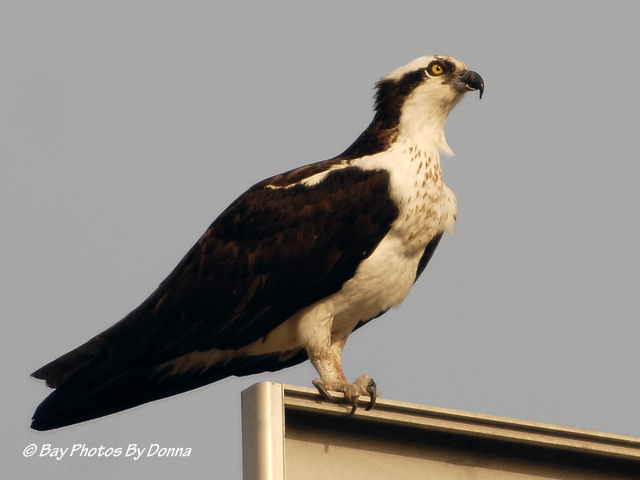 But FINALLY I’m able to post this exciting photo & info update on the well-known Osprey that reside above a mile-stretch of high-traffic volume on Rt. 50/301 (a dual highway with three lanes each side) here where I live in Grasonville, Maryland. Last season, we had three active nests with attempts of two more that didn’t stay. 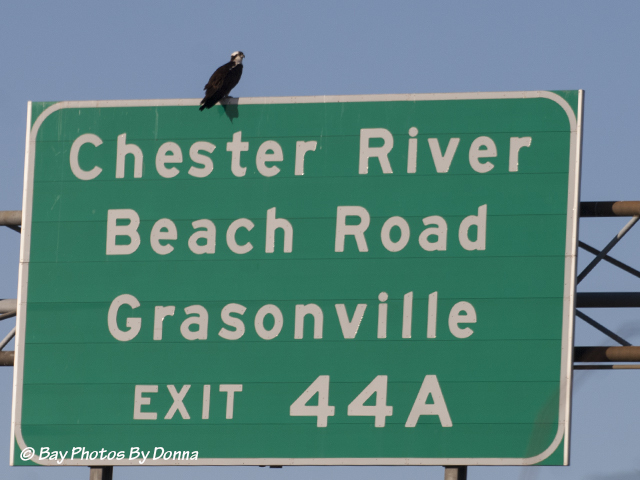 Three Osprey have already returned this season along that corridor, the lonely first one I sighted March 5th is still perching/eating daily on the sign and his/her nest, waiting for a mate to return. 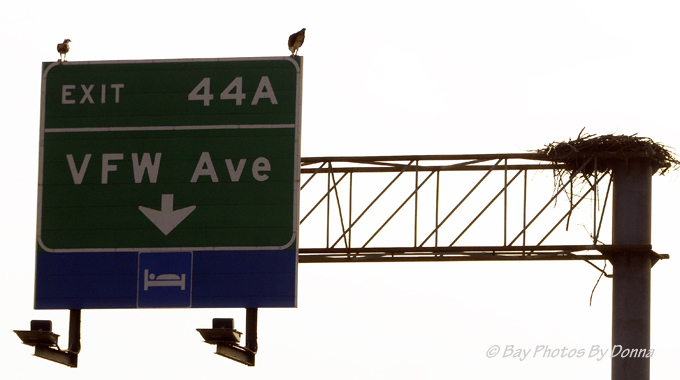 And less than a quarter-mile west of that Osprey where Exit 44A actually occurs along with another sign, we have a mated pair that have returned. I sighted the first one on March 14th and then saw both the evening of March 15th, each eating a fish. I jumped off the ramp and headed back to them. Cuz I had my cameras!! 🙂 YEA! Their Maryland home – it withheld the winter elements pretty good! 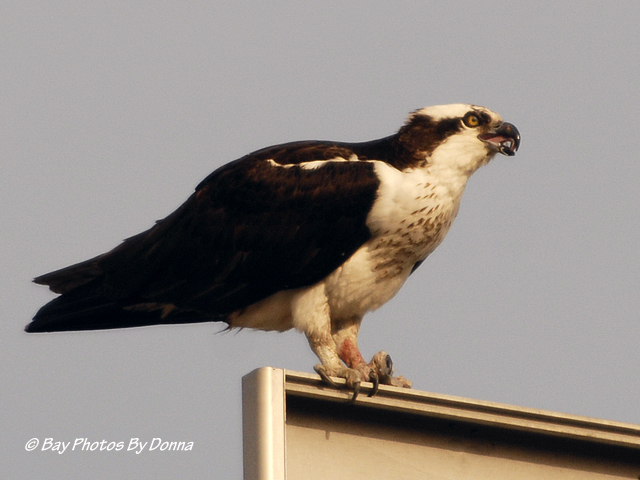 Mr. Osprey wasn’t so keen on my presence, while the Mrs. continued to eat and not care. 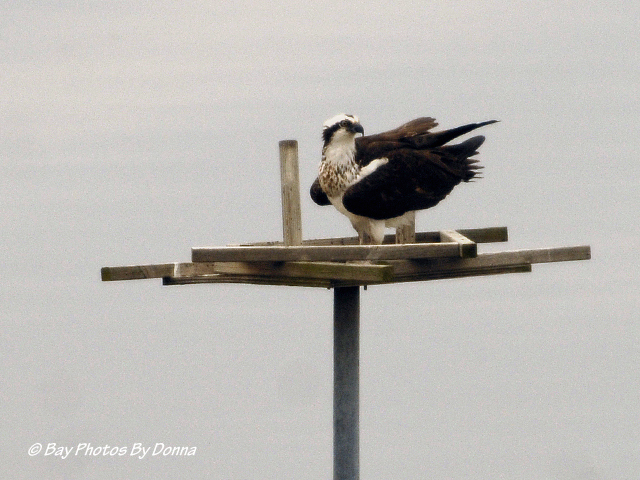 Mr. Osprey decided to see if he could force me to leave and left the sign with his dinner. Off to circle around again to try to get me to leave. Geez, what about all the cars and tractor trailers zooming below?!! The Mrs. calling her mate back. As the male circled back to land and the female resumed her eating, I took the cue to get back in the car and leave them to their dinner. How rude of me to interrupt! 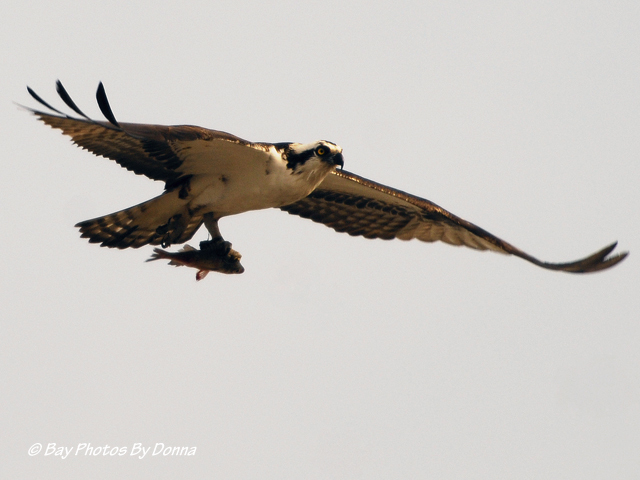 I have to tell you, I sure got my Osprey fix during those four minutes of photographing…. I headed home and drove past the Osprey Point platform closest to Rt. 18 to check on the pair I previously sighted and posted as No. 2 and 3. 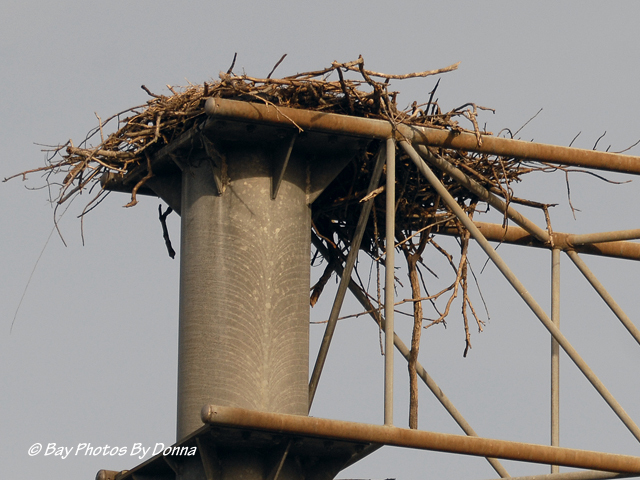 They have wasted no time in starting to rebuild their nest that was lost over the winter. A little sloppy so far but give them time! Such Osprey excitement! 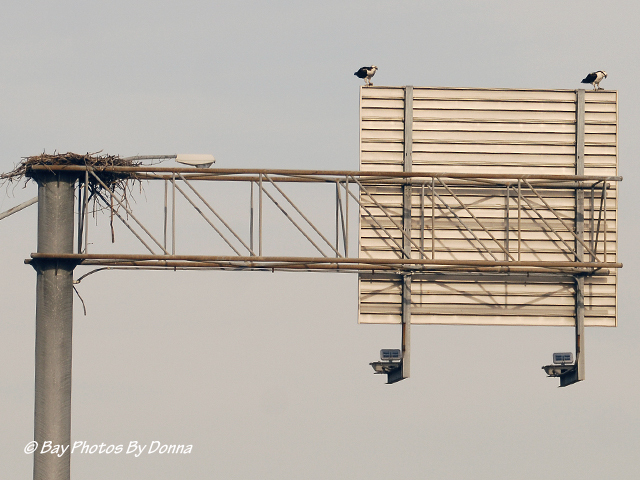 As I cruised my last mile home, I wondered if there were any on our Oyster Cove platform, the Kent Narrows channel markers where two more nests were active last year, or the two platforms I can see over at CBEC, all from my balcony. I quickly checked and found our platform empty. 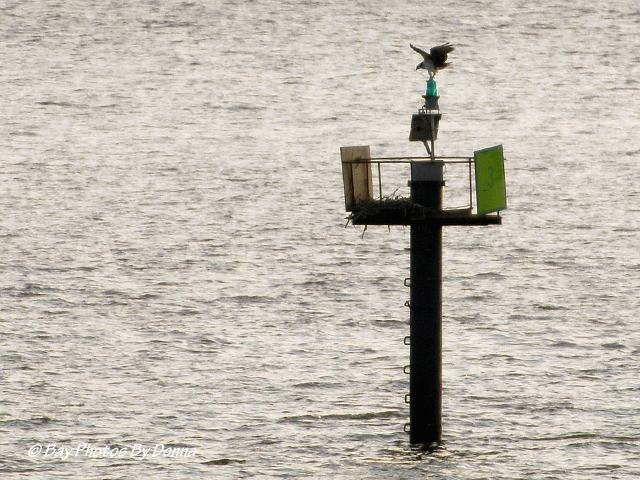 But I did sight an Osprey on the Kent Narrows South Entrance channel marker and two American Bald Eagles on the Prospect Bay channel marker (I need binoculars to see this one). 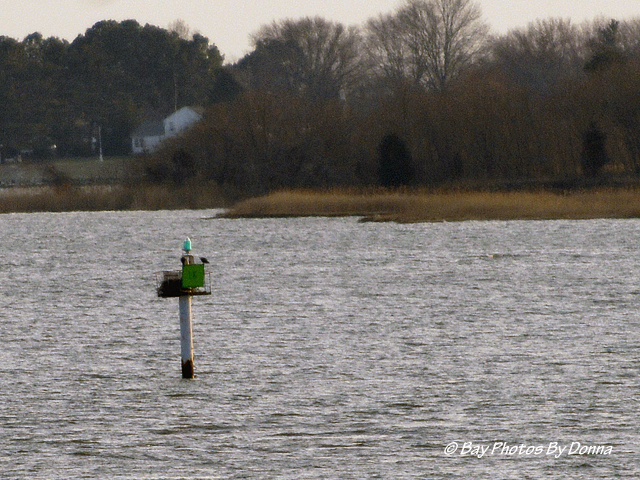 Both of these channel markers had active Osprey nests last year which are still intact. 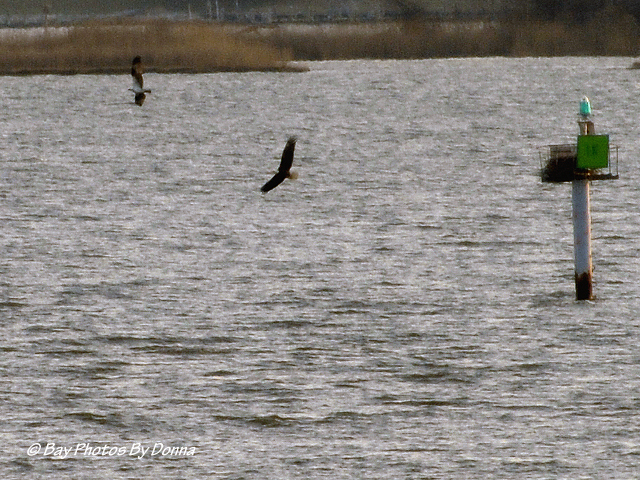 No sooner than snapping those last couple shots, the Osprey left his channel marker and flew directly towards the Eagles, which one flew off while the second one had an aerial ‘dog-fight’ with the Osprey. 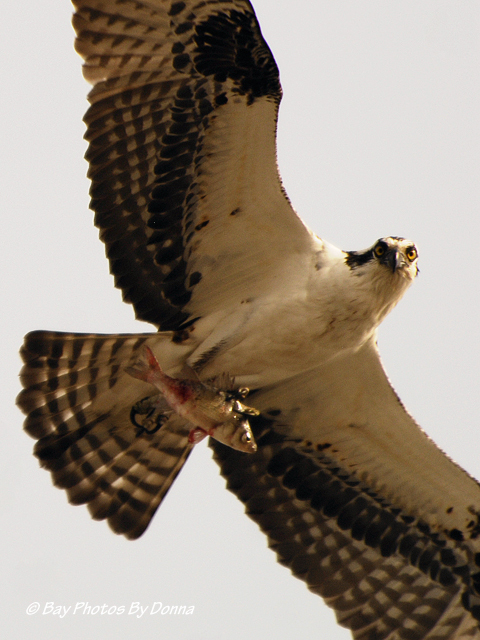 What was the Osprey thinking?? It could have been two against one! It really looked like it was more for fun than anything. 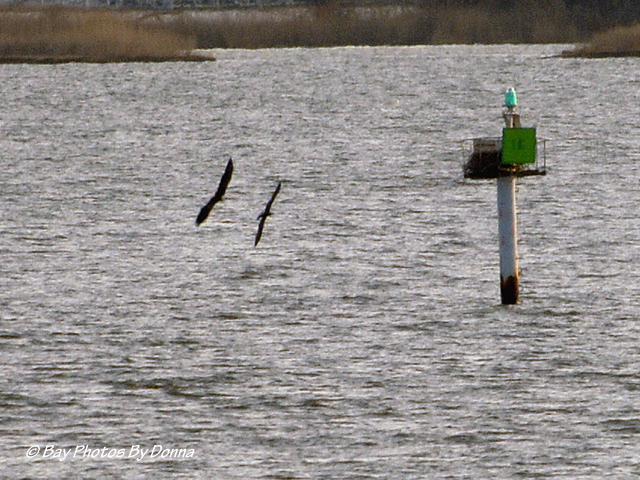 The Osprey flew back to ‘his’ channel marker while the second Eagle flew towards CBEC where his mate went. 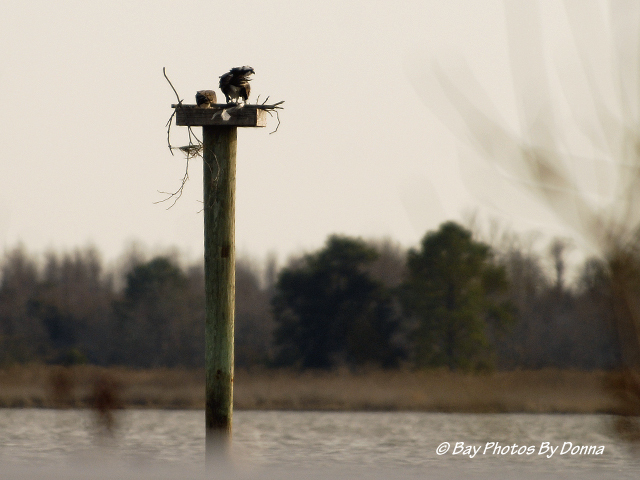 The photos aren’t very clear since I’m so far away but it was exciting to already see and show interactions we have between the Osprey and Eagles in our area. 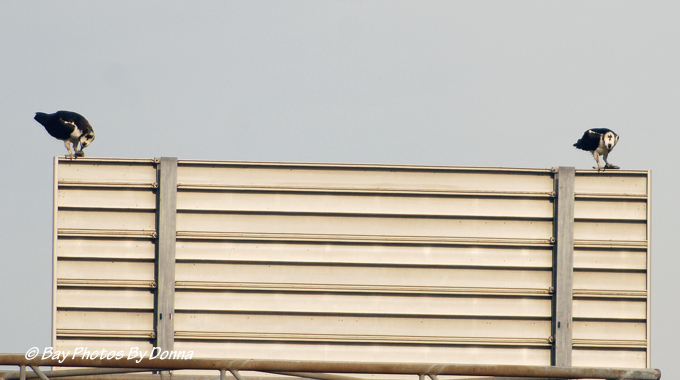 That’s the update of our area Osprey from my sightings. Two other local bloggers have sighted and reported on them too, TheEasternBabe and AChesapeakeJournal. 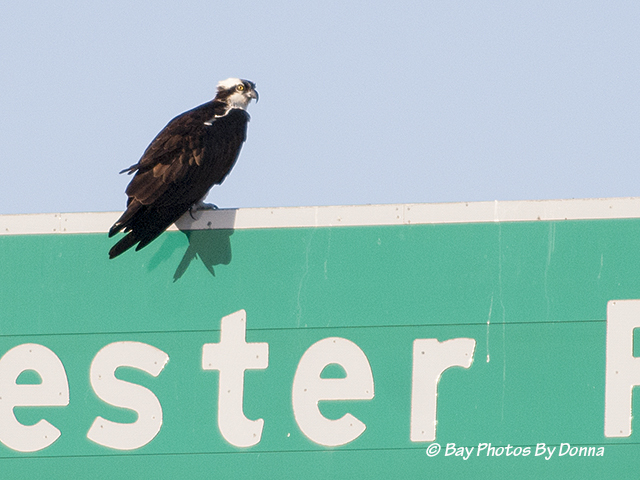 I guess you can tell us Maryland Eastern Shore locals get a little excited with the return of the Osprey. We still have many more to arrive too. 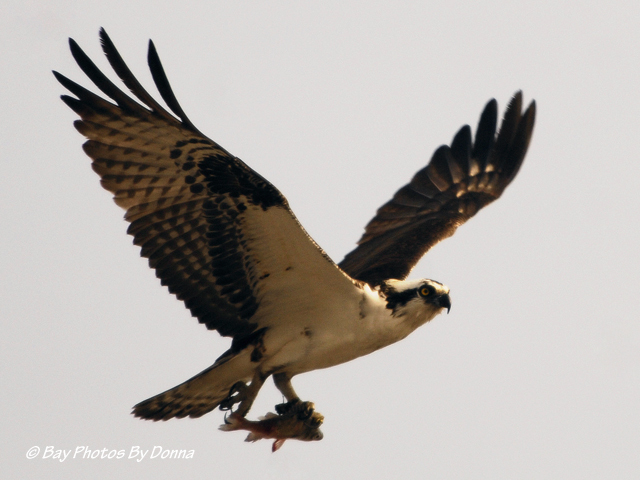 We are fortunate that our Chesapeake Bay and its tributaries continue to increase in Osprey numbers each season, along with the American Bald Eagle. Until next time, enjoy your week and thank you for stopping by! Thanks for the update and the photos! It may be a little longer before more osprey return if this arctic blast we’re getting hits your area. I am picking up on the excitement – here’s hoping for a good season! Thank you Nia! They are fun to watch and it’s a fun challenge to me to photograph them! beautiful, beautiful shots!! i’m hoping to get to kayak in Marshy Creek sometimes this summer. i went to CBEC last two summers ago but the water was kind of rough so i didn’t get too far. Thanks Tammy! Hubby & I keep saying we’re going to try kayaking in Marshy Creek too from CBEC. 🙂 Maybe this summer for us! Wonderful photos and great story, Donna. 🙂 I’m glad you carry your camera with you. These photos are FANTASTIC. 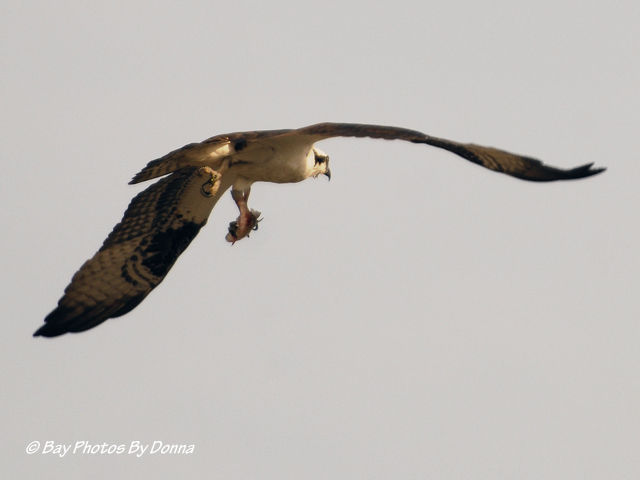 I’ll have to show my husband later – Ospreys are his favorite! Thanks for the mention Donna, I am LOVING the updates on this pair, I find it incredible that they roost up there, a testament to how many we have in this area & nesting shortage. What amazing captures. Happy spring!!! Thanks Amanda and you’re welcome! 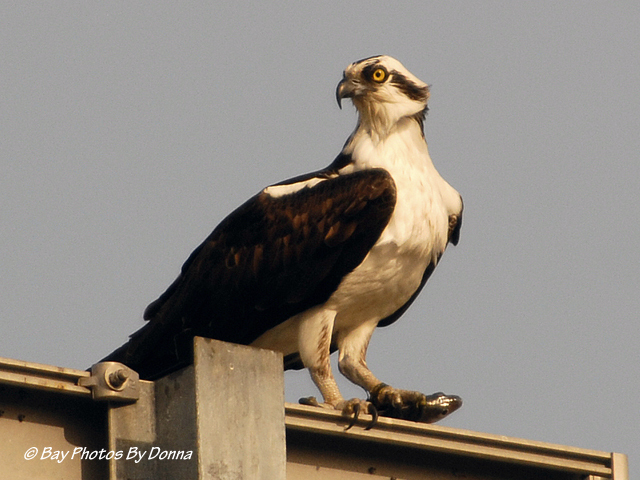 Looking forward to hearing about your Osprey family too. Happy Spring to you too! Your pictures are absolutely AMAZING! And I do so enjoy and appreciate them. 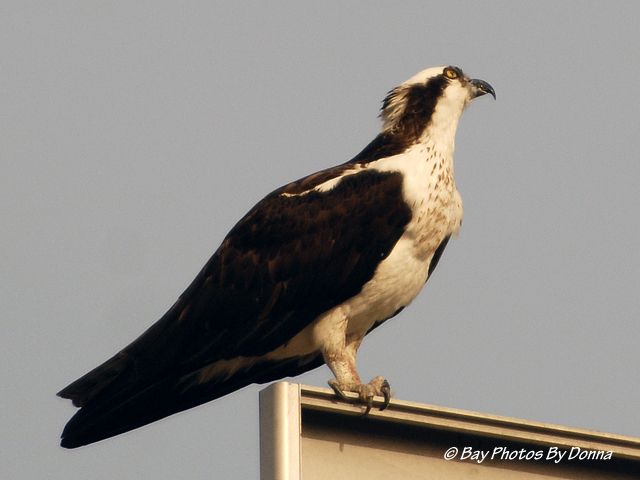 Mr Osprey checking me out – fantastic shot. You were fortunate (and skilful) to be in exactly the right place and very clever to take it. I hope it didn’t drop the fish on you. Thank you Tom, he was definitely checking me out! If he dropped the fish on/near me, he may have come after it and me, lol. But I think that grip wasn’t letting that poor fish go. I am very lucky, and thankful!